That I got two months ago and have been using regularly to dry the oops-we-planted-too- much-basil. I can use the dehydrator to make sun dried tomatoes. A fat duh moment because I pitched sun dried tomatoes to husband during the We Should Buy a Dehydrator talk. This wasn't a major negotiation because I had the washer and dryer covered with drying chocolate mint, peppermint, Chinese basil, Genovese basil, lavender, and cilantro at the time. 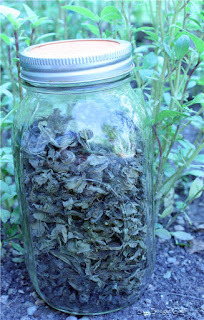 Learn how to dry herbs with out a dehydrator on my food blog Lazy BudgetChef. Over the weekend, I turned into a dehydrating maniac because I just figured out that the stuff I shove in the freezer because it is close to EMEOCML will be less likely to develop freezer burn and become compost fodder (I am the Queen of Freezer Burn *royal wave*) if I dehydrate it instead of freezing it. I dried garden basil and a few tomatoes. I have my eye on the bitter melon in the freezer. 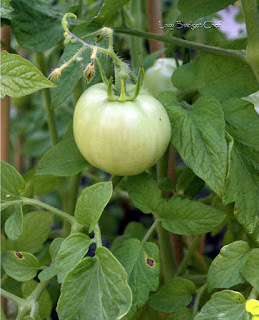 If we have another winter blackout, I won’t have to deal with garden vegetables melting in the freezer either. My dehydrator didn't come with a recipe book. So far I’m winging it. Do you have any food dehydrator recipe book recommendations or recipes that rehydrate food beyond soup?